Last week I received a very nice e-mail from Bruce KX4AZ. 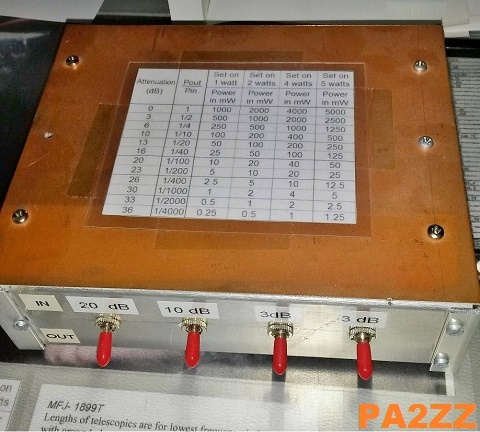 He searched the net with "WSPR 10 milliwatt" and found the page on "WSPR with 10 milliwatt" on my PA1B website. hi. Bruce KX4AZ is a operator that makes very interesting WSPR spots with just 10 milliwatt. 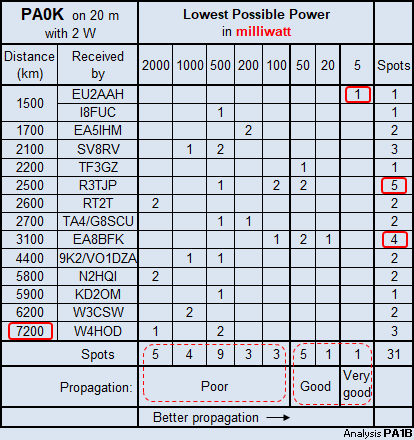 Believe it or not, but a WSPR station with 10 mW will ONLY be spotted, when the propagation is very good. Please study the diagrams below, to convince your self. 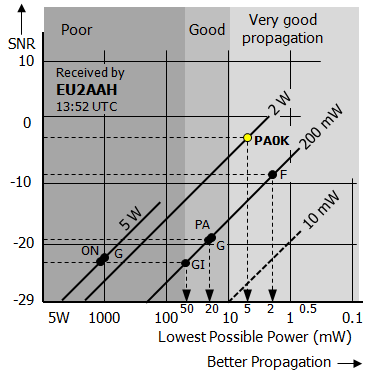 To show the propagation, I developed the Lowest Possible Power diagram. You can immediately see how good or how lousy the propagation is, for each individual spot. 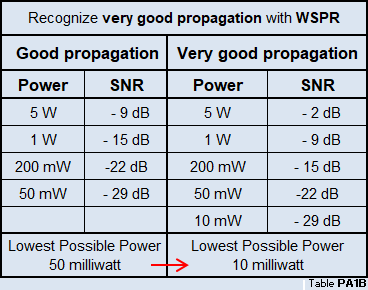 The better the propagation, the lower the Lowest Possible Power. 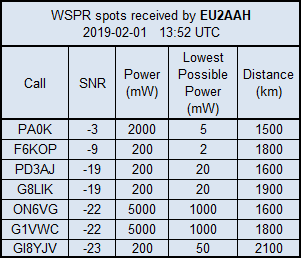 2019-04-19 I visited the WSPR old database and collected some interesting spots. 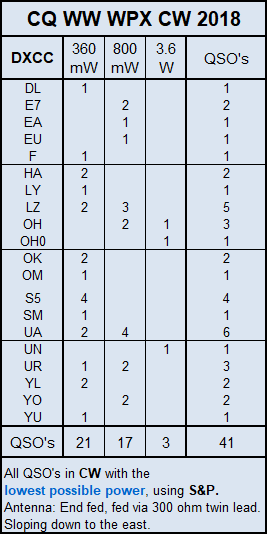 In the time slot of 17:46 UTC ND7M spotted 7 stations. 4 stations with 5 W, 1 station with 1 W, W6CLB with 100 mW and KX4AZ with 10 mW. 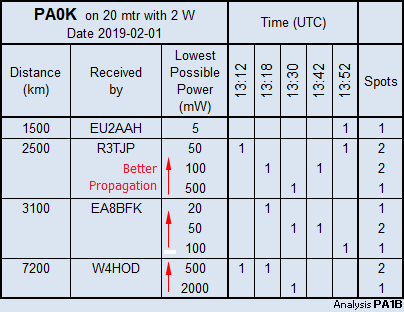 Luckily for Bruce, the propagation from the stations with 5 W and 1 W, to ND7M was not that good, so Bruce's signal was not over shouted by the 1 W and 5 W signals. Something that can easily happen, even with a power of 100 mW. In the first diagram Bruce was spotted by ND7M with a SNR of -29 dB. It's the spot in yellow, on the line of -29 dB and the line of 10 mW. So in this time slot Bruce needed the full 10 mW. Hi. 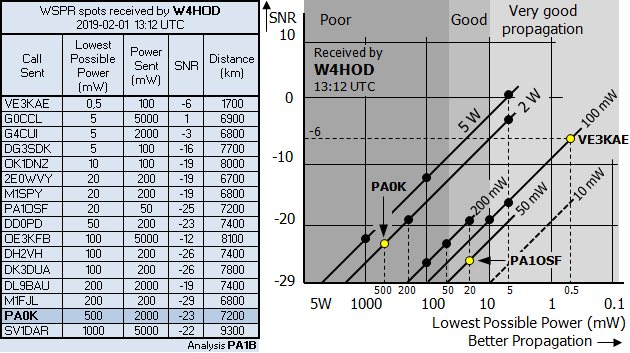 In this time slot the best propagation is shown by the spot of W6CLB with 100 mW and a SNR of -15 dB. This spot has a Lowest Possible Power of 5 mW. Thus about 3 dB better than the spot of Bruce. 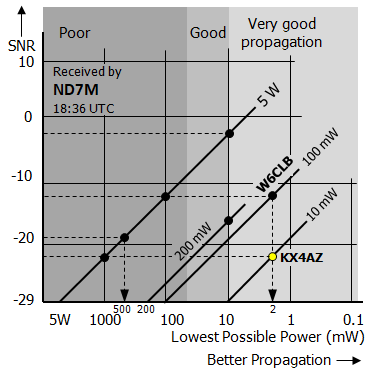 The second diagram shows the next spot of KX4AZ by ND7M. 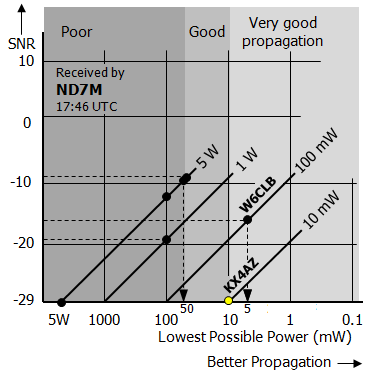 In this time slot the signals of W6CLB with 100 mW has a SNR of -12 dB. The signal of KX4AZ has a SNR of -22 dB. please notice that both spots, show the same very good propagation. The Lowest Possible Power of both stations is 2 mW. The signal of Bruce is even about 7 dB stronger, than in the first time slot. It's great fun to make CW contest QSO's with very low power. When the S-meter goes up, I lower my power accordingly. In the last batch of eQSL's I found a 3 eQSL's that confirmed QSO with 80 mW. Onze kleindochter heeft vanmorgen op Scouting een vlieger gemaakt, van een stevig stuk plastic en een paar stokjes. 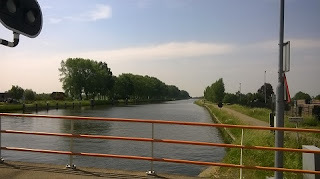 Omdat het plakband op sommige punten al losliet, hebben we de bevestigingspunten verstevigd met breed en sterk plakband. 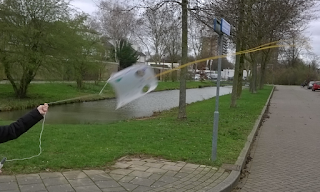 Na een paar half gelukte vliegpogingen, hebben we een derde (dwars)stokje geplaatst, om de vlieger "open" te houden. Dit was een onmiddelijk succes. De vlieger kon nu uit de hand opgelaten worden, zonder vrijwel onmiddelijk dubbel te vouwen. De sterk wisselende wind vraagt echter heel wat vaardigheid van de "vliegenier". 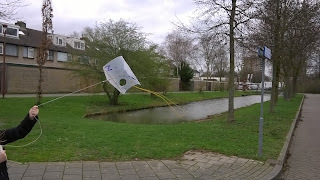 Het lukte opa om de vlieger, in sterk wisselde wind, tot zo'n 6 meter boven de grond, te laten opstijgen. Hi. Yesterday morning early I listened to the Christmas Eve morning transmission of SAQ. This Swedish station was built in 1924 to transmit messages in Morse code to North America. SAQ transmits a few times a year at a frequency of 17.2 kHz. About twenty years ago I made a large loop to listen to VLF stations. The loop consist of a cable of 5.6 meters with 12 wires, that are connected is series, to get a strong signal. A loop amplifier of a FET and a bipolar transistor pick up the signal of the loop. The signal is fed back into the loop to increase the Q-factor. With a 10-turn potentiometer I can adjust the Q-factor. I can even run the loop smoothly into oscillation. Which is really great to determine the resonance frequency. The signal of the loop amplifier is fed into a frequency converter, built with a SO42p. 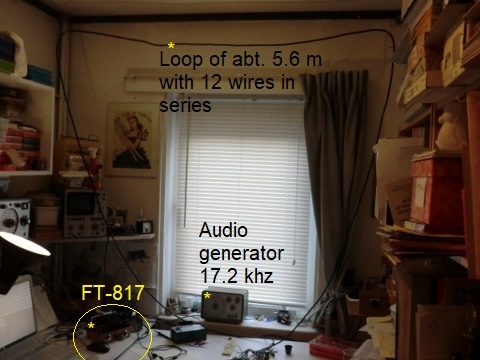 I listen to the signal on my FT-817. My main objective of the morning was to first tune the loop. After that I would write down the message, that was to be transmitted in CW (morse code). The tuning was an immediate success. When I heard SAQ transmitting vvvv SAQ I started tuning by placing and removing capacitors with different values. I ended up with 3 capacitors in parallel. 47 nF, 43nF and 8.2 nF. Yes, I don't know were it came from, but it is really 43 nF. Hi. The signal was strong, I give a 579 by ear. I did not look on the S-meter. After tuning, it was time to make room for a paper, to write down the message, that would be transmitted. 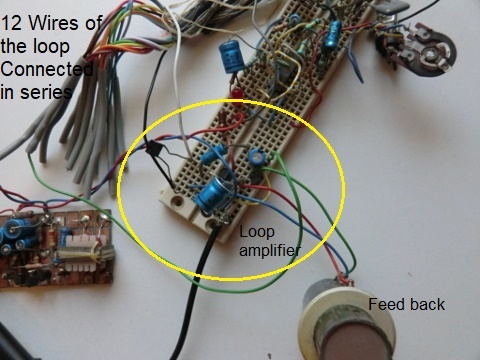 When I moved the breadboard with the loop amplifier about an inch, the circuit went dead. When I moved the circuit back, I heard the signal again. Then I let go of the circuit. It went dead again and whatever I did, it would not come alive again. OOPS. I still don't know what it is. I found one loose wire. It was the white wire in the picture below, but that was not the only problem. So I missed the message. At first I felt terrible, but later that day I realized that, I did what I wanted to do. I had easily tuned the loop and I heard how loud the signal was. So I could give a report. If it would happen to someone else, I would say: "Well, you have a great story to tell." 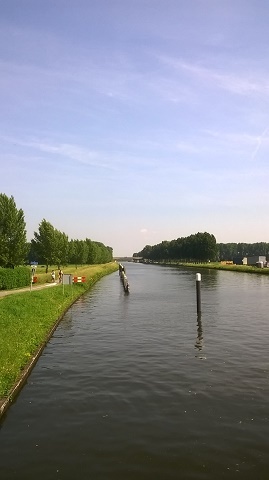 Het is als weer even geleden. Eind mei zijn we vanaf Vianen langs het Merwede kanaal gefiets, tot aan de Zwaankuikenbrug, waar deze wegwijzer staat. 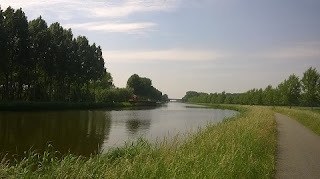 Het Merwede kanaal is een mooi kanaal geflankeerd door bomen. Ik heb hier ook wel gevaren met de kano, toen ik nog dakdragers had om de kano op de auto mee te nemen. More than 20 years ago I built a active loop antenna for VLF. I listened from 100 kHz down to 20 kHz. Today there was a special transmission in CW of SAQ from Grimeton in Sweden on 17.2 kHz. The transmitter is a generator that makes a power of 200 kW with a frequency of 17.2 kHz. The station has a huge antenna. The station was used 100 years ago to send messages in CW to North America. 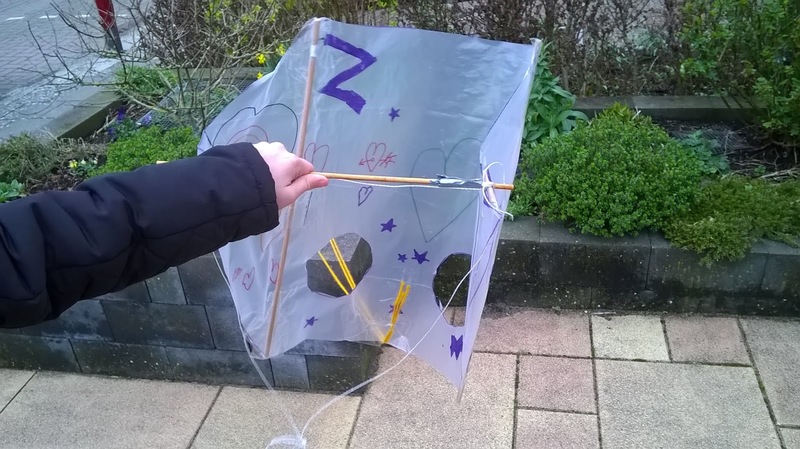 My loop antenna is made of a cable with a length of 5.5 meters with 12 wires. The wires are connected in series. This inductance is tuned with a capacitor. The signal of the loop is picked up by a FET, followed by a bipolar transistor, that form a follower. Placing the loop in the shack was easy. But then I had to remember how to connect the wires of the loop to the loop amplifier. Luckily I found the schematic in the article, that I wrote for the spring issue of 1997 of SPRAT. With the schematic I connected the 3 wires of the loop to the loop amplifier. The Databuch 1980/81 Integrierte Schaltungen für die Unterhaltungs-elektronik of Siemens gave the information on the SO42P mixer, that I use in the frequency converter. After more than 20 years I could not remember which pin I used as an input. But with the book and a magnifying glass, I could connect the coax between the amplifier and the converter to the right pin. Then I tested the frequency converter. On the oscilloscope I could see, that the oscillator was running and I could hear the carrier on 8 MHz on my receiver. So now it was time to tune the loop. I can drive the loop gently into oscillation to determine the frequency with the oscilloscope. 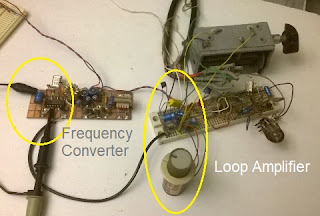 With a capacitor of 47 nF my loop was oscillating on 25 kHz. I calculated that I would need a second capacitor of 47 nF in parallel for 17.2 kHz. But in my boxes of capacitors, there was only 56 nF, so with the extra C the loop was tuned to 16.6 kHz and I started listening. A quick look at the clock showed the transmission of SAQ had already started. At first I heard a strong crackling (gekraak), but when I tuned the receiver I heard a weak CW signal. With the very strong crackling I could only copy a few letters. But then I realized, that this noise source must be very close, because of the strength of the noise signal. Well my loop ran less than an inch from my Led lamp, that is placed on the oscilloscope. The next transmission of SAQ will be on the 24th of December 2018. If I start in time, to build up the circuit, I will be able to tune the loop precisely. And I will have time to adjust the Q of the loop for the best reception. hi. 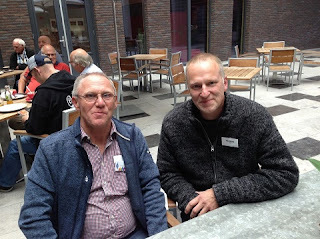 This year I attended the Veron HF-day because of the interesting readings together with Henk PG7H. I was surprised to meet a fellow blogger, Bas PE4BAS. We met Bas PE4BAS and Tjip PD2TW, who had made the long trip to Apeldoorn. Bas and I had a lot to talk about during the lunch that we had later. I very much liked the two readings about the Aleksander alternator transmitter in Grimeton in Sweden by mr. Ola Hernvall. I enjoyed the interesting reading about FT8 by Jan DL1JAN. Later it was great fun to see Jan, presenting a small quiz in which he accidentally, showed the answers before the questions. (hi). Luckily Jan shows a great resilience. We applauded for Bas for reaching the 2e place in the PACC in the Low Power category. FB. But what I call low power, is very low power to the rest of all amateurs. Hi. Further there was an interesting reading about working DX. It was interesting to hear how the DX stations, try to pick up also QRP stations. 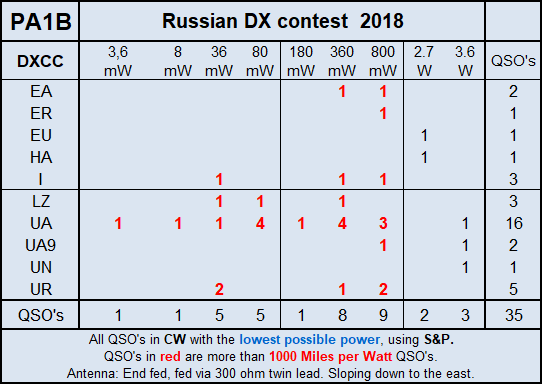 I had great fun with very low power in the Russian DX contest 2018. I made more than 30 QSO's on 14 MHz and 2 QSO's on 7 MHz. The propagation was good, so I could reduce my power when the S-meter goes up. 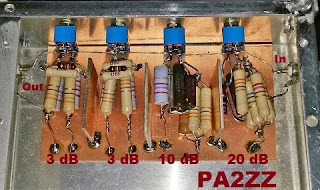 For a power of less than 360 milliwatt, I use the PA1B attenuator to reduce my power. I very much enjoyed the QSO with RT6A. The signal was about S9+20dB, so I could reduce to 3,6 mW. I was very lucky, because I heard RT6A 15 minutes earlier, but 10 dB less strong. But at that time, many stations were calling, so my modest signal could not be heard. hi. When I came on the band on 20 m, I heard a UA3 station with an ear splitting signal of S9 + 20 dB. So my first QSO I could finish with just 8 milliwatt, using the PA1B attenuator. WOW. Friday before the contest the contest, I repaired the support for the antenna. My simple mast was damaged by storm. It was sunny, when I went onto the roof. 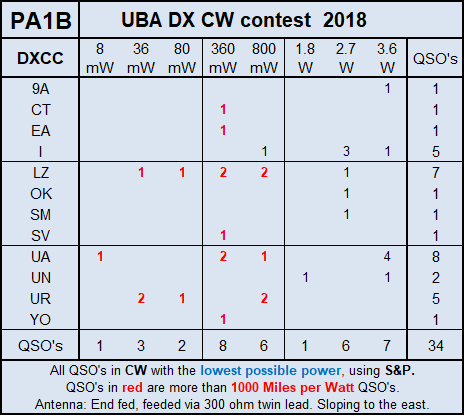 Just in time for the UBA DX CW contest. My antenna is an end fed that is fed via a 300 ohm twin lead. The twin lead acts as a counterpoise and acts as an impedance transformer. The end fed is sloping down to the east. 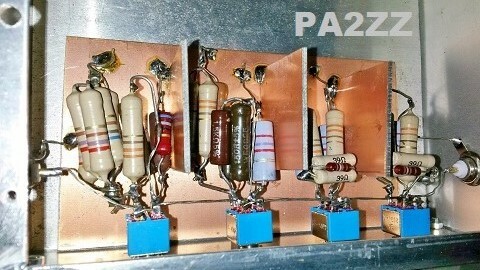 I made 20 QRPp QSO's with 800 milliwatt or less and 14 QRP QSO's with 2, 3 or 4 Watt. All QSO's are made with search and pounce (S&P). My CQ with 800 mW gave NO response at all. hi.